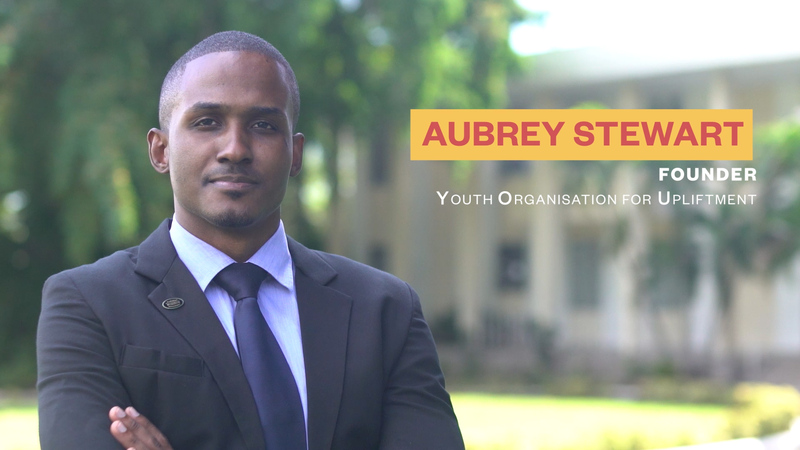 In 2009 Aubrey set up Youth Organisation for Upliftment, an umbrella company that nurtures young people in Montego Bay by providing a place for them to gain the various training, tools, and materials they need to make a positive change in society. We spoke to him about the organisation, the campaigns they run, and how they’re working to empower young people across Jamaica. What inspired you to set up YOU? YOU was established in 2009 after visiting a children’s home with friends. The road leading towards the home was in an awful state and we thought ‘we need to help these kids ‘cos this road is very bad’. If there had been an accident or fire at the children’s home, there’d be a problem with any ambulance or fire truck trying to get to that home – so it was important we fix that road. The first thing we did was write to the Member of Parliament responsible for that area – and of course, the first reaction was: who are these young people trying to write to him? We were 14/15 years old, I’m just 24 now. We came together, and we wanted to bring all young people in Montego Bay together because we wanted to fix that road. After writing and lobbying we were able to, not asphalt the road, but put temporary stuff on the road so things could pass easily. So that was the motivation behind this organisation being established. After that, we grew in membership and presence to the point of being recognised by the former PM, and also by MTV Staying Alive Foundation from the UK. What were the first campaigns YOU got involved with? In 2011 we wrote a project proposal to MTV’s Staying Alive Foundation and they gave us a grant of $1m which helped various projects across the island. We made a film ‘On The Edge of Desire’, trying to educate young people on how HIV is passed on from one person to the next. We finished that campaign, were given another grant from MTV and, after realising crime was a major issue in Montego Bay, we decided to establish the Crime Out Campaign. This encouraged young people to respond to crime within their communities by speaking to Dons and other young people and to take action together. We organised a Peace March which brought all the churches and institutions together to show Jamaicans and the communities that we are one and we can solve crime together. The partnership with RuJohn Foundation and YOU came about in 2014 when RuJohn was in the UK working on projects that give back to schools in the US. They realised that in Jamaica there were kids who weren’t going to school and who lacked school supplies, and community centers that didn’t have computers. So they came to Jamaica, researched our organisation because they’d heard about our work, and they partnered with us. RuJohn brought celebrities from the US to do acting and music workshops, basketball… all workshops that enable young people to learn more about themselves. From there we were able to give supplies to various schools – because sometimes getting that help from the Government can be hard. There’s now an annual camp that happens in Jamaica. Myself, along with the other scholars of the RuJohn Foundation, ensure that all things are put in place, planning of camp, mobilisation of young people from various schools, and also finding schools which needed the help so we can give them those supplies. How and why are you working alongside the Government in Jamaica? I am chairman of Youth Advisory Council of Jamaica – a team of 16 persons appointed by the Ministry of Youth and Education. Our responsibility is to lead the Youth Parliament in Jamaica which involves getting 63 youth parliamentarians from different constituencies involved in decisions and policy making. I think it’s important for young people to work with the Government, the private sector, and NGO groups because if we do things in silence, separately, then there’ll always be gaps. But if you can bridge those gaps by partnering with organisations already doing those things then you’ll find that your work will be even more effective. What is your hope for the future of Jamaica? I hope for the day when there is absolutely no poverty in Jamaica. I hope for the day when young people will have equal access to education and no one is left behind. I hope for the day when any young person who has a dream can achieve that dream by just focusing on that dream, and has opportunities and systems in place to achieve that dream. I hope for young people to be that change that the world is looking for regardless of sexual orientation, background or place they come from. We can all achieve greatness once we set our minds to it. So that’s my hope for Jamaica – and the future.